A MUST HAVE FOR ALL GYMNASTS AND CHEERLEADERS! ACRO DANCERS TOO! MSRP $39.95 - OUR PRICE SLASHED TO $19.99! BACK HANDSPRINGS ARE THE BASIC MOVE THAT MUST BE PERFECTED NO MATTER YOUR LEVEL! WHETHER JUST LEARNING A BACK HANDSPRING, OR TRYING TO PERFECT IT FOR TRANSITION TO HIGHER SKILLS SUCH AS ARABIANS, DOUBLE BACKS, TRIPLE TWISTS,... THIS DVD IS JUST WHAT YOU NEED! THIS PROGRAM IS DESIGNED TO DO AT HOME !!!!! This video program is for gymnasts, cheerleaders or any one who wants to tumble better. It's a fun & informative source for beginner basics, intermediate improvements and advanced conditioning. These fun-filled Olympic-class lessons encourage safety and skill achievement. "Have Fun, Be Safe & Push HARD!" Some DETAILS about this Video! This program is a collection of SEVEN complete videos (or sections). The complete program is 148 minutes long! Each video contains a warm-up, extensive lessons and a cool-down. Each lesson is designed to be performed IN THE HOME, in front of the Television. No padding is required, but a soft rug or carpet is recommended. Some of the exercises WILL require students to put their feet up on a chair... and up on a wall. 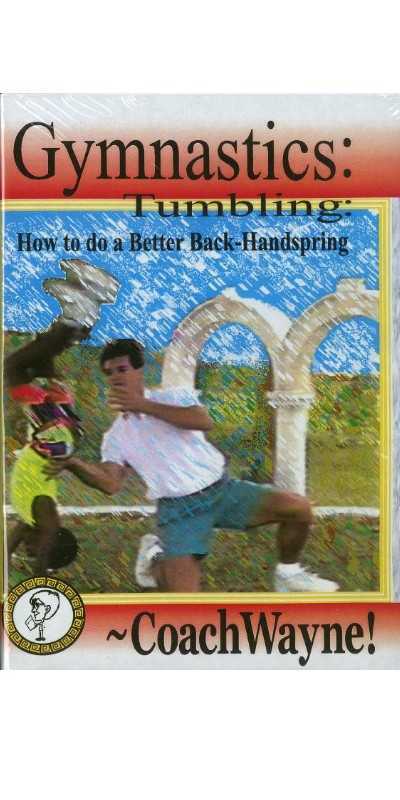 These videos are THE MOST detailed, comprehensive collection of lessons on the Back-Handspring that can be found in ANY book or video. There are SOME spotting techniques demonstrated in this video. The emphasis of the tape is upon preparing the body (strength, coordination, confidence, kinesthetic awareness, stretching, vocabulary, biomechanics and technique, benchmarks of success, mental rehearsal, self-motivation, etc) for hands-on spotting WITH a coach. This is a FUN, ENTERTAINING, EFFECTIVE, and extremely WELL CRAFTED production. It is intended to enhance the gymnastics experience and encourage a PROFOUND understanding and appreciation of the art of gymnastics. Younger viewers (especially) will consistently participate AGGRESSIVELY with the exercises and demonstrate SIGNIFICANT improvement after each work-out. Tumblers with MODERATE/Intermediate levels of experience, but who do NOT have consistent & secured handsprings will benefit greatly. Core principles, benchmarks of success, and self-progressing strength-building exercises allow for even the most practiced athletes to have a tough work-out. The lessons presented will help INSURE that the viewer has a DEEP and BROAD understanding of what it takes to SAFELY perform handsprings. This product has stood the test of time. It has been on the market and sold internationally since 1991. Coach Wayne stands behind the quality of this product. ...more details about this Video! World-wide, many of the (over 1,000) students who have purchased this video do NOT have regular access to a qualified gymnastic/cheer/tumbling instructor. This video is INCREDIBLY helpful in those circumstances. However, Coach Wayne HIGHLY recommends that all tumblers participate in live tumbling lessons, clinics, private classes or group spotting activities. The exercises in this video collection are appropriate and extremely helpful for beginning, day-1 students, ages 5 and up. Because so many tumbling skills are inter-related, these exercises are NOT exclusive to the Handspring, but are ALSO applicable to MANY other basic skills. INSTRUCTORS PLEASE NOTE: There are numerous exercises and techniques in this collection that you will find insightful and valuable for your lessons. HOWEVER, the GREATEST benefit is NOT in YOUR DVD player ... but in the DVD player of your students. By having this DVD at home, your students are expanding the amount of time that they are participating in PREPARATION for your class. When they walk in, they'll be STRONGER, and MORE ATTUNED to your lessons. You'll be able to dedicate MORE time to coaching technique and less time to raw strength-work. In this picture you see Brian demonstrating the handstand position, a key feature of a back-handspring. Having strong back and tummy muscles makes a safer and stronger handspring. In day one we introduce four exercises to strengthen the middle body, plus stretches & mental conditioning. The back-handspring often takes many months (or even years) of regular practice to perfect. It's used in Martial Arts like Karate, in cheerleading routines, baton-twirling competitions, many theater & dancing routines and of course, artistic gymnastics. The exercises and lessons needed for better back-handsprings also condition the body for many other skills. Here we focus on how to best prepare the wrists & arms for the powerful push needed in great back-handsprings. We introduce five new exercises. This picture shows one of the many wrist exercises we practice. In the exercise illustrated below, Christy (the GIANT HANDS) is clapping with Coach Wayne in an alertness drill. How drills are performed is important, but understanding WHY is critical too! For those of you not familiar with the Back-Handspring, (also known as a flic-flac) it's a beginner-intermediate level tumbling skill. It's often featured in movies and music videos. The back-handspring sometimes follows a"Round-0ff" and in "power-tumbling," it is usually sequenced with many handsprings in a row, followed by a back-tucked salto (flip!) It's an EXCITING and DYNAMIC skill that's LOTS OF FUN! This picture shows Jennifer rolling to a standing position. It's a simple coordination exercise. The PUSH into a back-roll is similar to the PUSH in a back-handspring. You can see furniture in the background of this scene because we taped this session in the living room of a house. All the exercises on this video CAN be performed in front of the TV at HOME. Each training session includes warm-up exercises, and specific drills focused on an important part of the body for that particular lesson. Powerful concepts for great tumbling techniques such as timing, coordination & injury prevention are illustrated in each daily lesson. Day four is a mid-week rest from tough strength-building exercises. The focus of lessons is on proper positioning of the arms, angle of knees in the leg-push (see pic) and how to measure progress. How long should a handspring be? You'll see that both boys and girls with a mixture of ages, skill levels and body sizes (short/tall/fat/skinny) demonstrate the exercises and lessons. This is a GET UP and GO show, with solid, back-to-basics FUN. How straight should your legs be when jumping into your handspring? The ankle is a joint in the body that is particularly prone to injuries caused by jumping. To ensure safety, good tumblers maintain STRONG, FLEXIBLE ankles. In this exercise-set we focus on stretching and strengthening. In this picture Chasity (with her giant feet) is demonstrating how the ankles flex and point. This 109 minute long Valu-pak video is jammed full of great exercises and lessons, all of which can be performed AT HOME, in front of the TV. The tape is actually a compilation of SEVEN complete training sessions, one for each day of the week. Here you can see Derita demonstrating the tremendous REACH in the handspring. Where should the head be positioned? How wide are the arms? What CAUSES the SPRING off of your hands? Each day offers a healthy dose of positive motivation, mental conditioning and of course lots of strength work. Warm-ups and Cool-downs help prepare muscles and focus attention. We demonstrate some spotting techniques in this video, but they are NOT emphasized. No video can take the place of a hands on coach in a live gym class. But, gym lessons, when coupled with the extra workouts in this video have proven to be a TERRIFIC combination. The picture you see below, exhibits Lisa during a cooldown stretch. A wide variety of skill levels are demonstrated in each segment so that beginners... just learning gymnastics for the first time... feel comfortable with the common mistakes, goals and language of gymnastics. By adding weights and repetitions to the exercises, more advanced students gain power & understanding of the refinements needed for great tumbling. To practice your back-handspring lessons at home, all you'll need is a clear floorspace that's soft enough to roll on. (4'x5' or about two square meters) A tumbling mat is recommend for comfort, but not essential; a rug works perfectly well. You'll also need a narrow bit of wallspace to push against. A sturdy (closed) door is perfect. Lastly, you'll want a chair our couch that you can put your feet on.